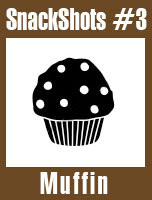 The always hungry folks over at the Greedy Gourmet are hosting the Snack Shots blog event and the theme is the trusty muffin. You can find out more about the event, which runs until May 6, 2008 here. 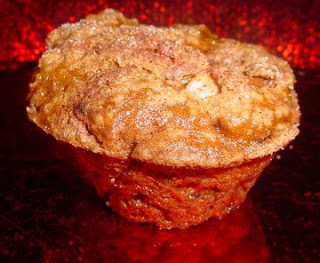 Grease 2 12-cup muffin pans or use paper liners. Preheat oven to 350 degrees F.
Mix together dry ingredients (except nuts and Turbinado sugar). In separate bowl, mix milk, vinegar, oil and eggs. Stir both together to combine. Fold in apples and nuts. Fill muffin cups with batter about 2/3 full. Sprinkle tops with Turbinado sugar. The tops get nice and crusty from the sugar. This recipe can stand a bit of over-baking, as I forgot all about my poor second batch and left them in for another 20 minutes! They were hard as rocks at first, but I froze them and then they calmed down to perfect texture when thawed. For our Gluten-Free Book Signing, I wanted an elegant dessert that would be gluten-free and vegan so our circle of family and friends could eat together. I consulted the newest cookbook on my shelf, Isa Chandra Moskowitz' and Terry Hope Romero's "Veganomicon: The Ultimate Vegan Cookbook" (NY: Marlowe & Company, 2007) and there was an appropriate recipe, but alas, unlike many of the recipes in this awesome tome, it was not gluten-free. Undaunted, I tied on my apron and went at it. I used a combination of flours to replace the wheat flour: garbanzo bean for taste, buckwheat for structure and brown rice to make it fluffy. There was no hope of rolling out this squishy cookie dough, more the consistency of mayonnaise than a stiff dough the authors encourage you to mix with your hands. Instead, I spooned out tablespoons of the dough out on the cookie sheets and sprinkled on a combination of black sesame seeds and Turbinado sugar crystals. The cookies spread out too much and got brittle, so I made the second batch out of teaspoon-sized lumps and kept the baking time short and they came out very elegantly. Preheat oven to 350 degrees Fahrenheit. Lightly grease two cookie sheets. Sift flours, baking powder, baking soda, salt, ginger and cinnamon. 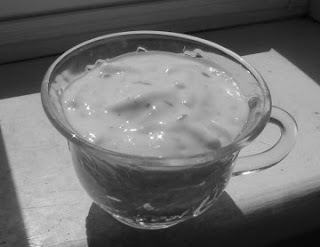 In the large bowl of a standing mixer or using a handheld mixer, cream shortening until fluffy. Add peanut butter, rice or corn syrup, sugar, soy milk and vanilla. Beat until creamy, about 5 minutes. Stir in candied ginger by hand. 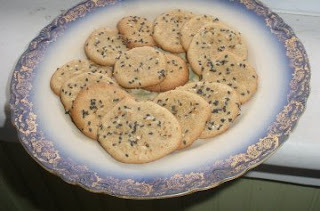 Place teaspoonfuls of dough onto cookie sheets. Don't use more dough, as the cookies really spread out while baking. Separate each lump of dough at least one inch apart. Sprinkle with a blend of sesame seeds and Turbinado sugar crystals. Bake 12 minutes in oven. Let cool on cookie sheets 2 minutes before lifting gingerly with a thin spatula to let them cool on baking racks. These cookies are pretty delicate when cooling. 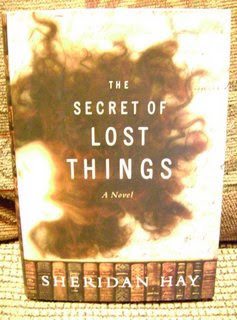 Sheridan Hay, author of the biblionovel "The Secret of Lost Things" will be signing copies of her book at our shop, Old Saratoga Books, on Saturday, May 3rd at 5 pm. Old Saratoga Books is located at 94 Broad Street in Schuylerville, New York (nine miles east of Saratoga Springs). We will be in full party mode with live music and two next door art gallery openings that evening so if you're in the neighborhood, plan to visit our historic and cultural village. My gluten-free buddies and their friends are welcome to come for some gluten-free refreshments to go with all this culture. "The Secret of Lost Things" has received much critical acclaim and centers around the emigration of a young Tasmanian orphan, Rosemary, who arrives in New York City to work in a used and rare bookstore. There are plot threads involving a long lost Herman Melville manuscript, and a host of eccentric bookstore employees and rare book collectors. More information about Hay and her novel can be found at my other blog, the Book Trout. If you would like to reserve a copy of "The Secret of Lost Things", please let me know at infoatoldsaratogabooksdot com and I'll be happy to have Ms. Hay sign it and we can ship it to you later. Back to the kitchen to cook up some more snacks.....I'll post back after Saturday's event to let you know how things went, and, as importantly, how the snacks went over. 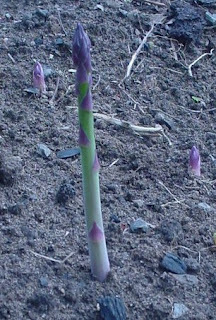 The warm spell around here has coaxed up the first welcome spears of asparagus and they are being cosseted and cooed at by yours truly. Asparagus is beloved by all in our family and I have carefully pulled out the weeds and crabgrass that have invaded my tender asparagus patch and fluffed on some light compost to protect my little green babies. First up for these luscious spears is a dunk in some White Bean Dip, an easy pantry recipe you can whip up in a hurry when dinner preparations leave you frazzled. It is also a great dip for parties, as you can leave it out for hours without worries about spoilage. 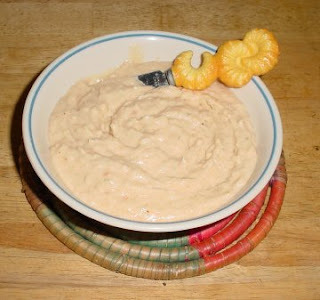 White Bean Dip pairs delightfully with vegetable crudites, breadsticks and crackers, all gluten-free, of course. I blend all the ingredients in my food processor, but mashing with a fork works well too. Resist the temptation to add garlic and hot peppers to this delicate-flavored, but hearty-textured dip, as this will tip the dip entirely too far into the hummus direction. Let sit at least one hour at room temperature before serving to meld flavors. 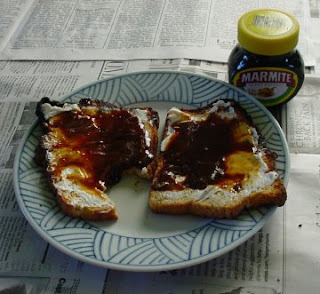 Youngest Daughter is going to Australia and New Zealand in July as a Student Ambassador and in our pre-travel research, we all tried Marmite. We couldn't find Vegemite in our area which is the Australian version of this yeasty spread, so British Marmite was snagged for our table. There are certain things that you have to be British, or at least older than me, or possibly both, to appreciate: skiffle music, salt-cellars with a single hole, [and] Marmite (an edible yeast extract with the visual properties of an industrial lubricant). We tried it on toast spread butter first, and then spread with the sticky brown paste. It was OK, but nobody has been quick to reach for the jar since. I did use some Marmite diluted in hot water as a vegetable broth substitute when I was cooking up a casserole and it worked just fine, so we'll keep this cute little brown jar (shaped like the French Marmite cooking pot) in our pantry. But it certainly won't be replacing peanut butter as the stick-to-the-roof-of-your-mouth snack of choice in our household. In celebration of Earth Day and because I had the day off from the bookshop (we're closed Mondays and Tuesdays), I spent yesterday in the glorious sunshine, barefoot and bent over, planting my spring vegetable garden. I had chipped away over the last week on the unpleasant, back breaking part, edging my 25 x 45 foot plot with the square spade. My nonlinear efforts added a couple of square feet to this garden patch, but that just gives me more room to plant. Yesterday was a perfect seed planting morning. A light breeze kept the gnats at bay and the soil resembled chocolate cake crumbs, which I read somewhere is the perfect loamy texture to inaugurate the garden season. I managed to get in my spinach, climbing peas, lettuce, radishes and Italian dandelions. Dandelions! Yes, dandelions, because Dan and I like a lot of braised veggies with garlic and oil and this is some fancy Italian chicory that is a new resident in the garden bed that we are giving a chance. I already had some returning chives, Oriental poppies (for beauty and the bees; from a mixed wildflower seed packet from four years ago that keeps on showing up), cilantro, lemon balm, thyme and oregano. No spears up in the asparagus bed yet, but they'll follow the sun soon and then we'll get to gorging ourselves on them, roasted with garlic and herbs. If you fall in love with your garden each year too, then here's a book I have recommended and placed in customers hands over and over again. I buy it every time I see it when I'm out book hunting, and it never fails to find a good home. I have one copy for sale at Old Saratoga Books at present, but you could also probably find a copy at your local library too if you want to "test drive" it first. Cooking from the Garden, by Rosalind Creasy (San Francisco, CA: Sierra Club 1988). A gorgeous, photograph-packed book for home gardeners and cooks to drool over. Creasy thoroughly details theme gardens: Heirloom, Native American, Baked Beans, Cajun, Asian, French, Mexican, German, etc. and offers planting advice, recipes, interviews with gardeners, and a wealth of new ways to enjoy vegetables, herbs and edible flowers. The emphasis is on vegetables and herbs that taste and look good, and you'll find plenty of new varieties to try. One year I had a rainbow garden inspired by Creasy's book with yellow and orange tomatoes, purple beans, radishes in various pastels hues, and of course, the easiest vegetable anyone can grow, Rainbow Chard. Purple and yellow beans are also easiest to pick, as they don't blend in so well with the foliage. Here's to a bountiful garden season to all, even if you only have a few pots of basil on the porch or windowsill! I recently joined the Foodie Blog Roll (see sidebar) hosted by the Leftover Queen and there is a monthly Food Joust in the Queen's honor. This cooking event challenges participants to develop a recipe using three ingredients put forth by the preceding winner. The May Joust trio includes mangoes, cardamom and brown sugar, which inspired me to make a mango chutney to go along with all the bhaji mania and Indian-influenced recipes my family loves. Mangoes are a new fruit for me. I have bought many a jar of Major Grey's mango chutney, but I don't think I have ever enjoyed a fresh mango, much less cooked with one. I did a little research on various mango chutney recipes and none that I saw called for cardamom, but this spice has a nice ginger and lemon taste, so I thought it would work well in a chutney. The other chutneys I have made from apples and tomatoes have all turned a uniform molasses brown, so I thought a bit of red pepper would brighten up the color. My copy of Nuevo Cubano Cooking (by Sue Mullin, NY: Chartwell, 2003) advised wearing rubber gloves in case of skin allergy. A little more Internet research showed that mangoes are botanically related to my diabolical arch-enemy, poison ivy, which turns me into a puffball with slitted eyes, so I made sure to wear my dishwashing gloves when I chopped up these fruit. I did cut off a few yellow rubber fingertips as the mango flesh is slippery and has a maddening attraction to its huge, flat pit, but I didn't want to end up a scratchy, puffy mess, so I stuck with it. The best way to cut a mango is to make longitudinal cuts along the crazy center pit, and this website has lots of good instructional photos, so I am glad to have found that thanks to another Foodie Jouster. Then you can score the fruit and scoop it away from the peel directly into a bowl from the two outside pieces. I kept my pieces on the large side since I figured they would cook down in the chutney, and this turned out to be the case. Ripe mango is quite tasty and I will have to get some for future fruit salads. I have some experience canning, so I went ahead and processed my mango chutney in a boiling water bath, but since this only makes a small batch, 2 cups, you could also just refrigerate it. All the vinegar and spices should keep it for several months, if properly covered. If you do want to experiment with canning, it's really not as scary as it sounds at the outset. Do invest in a jar lifter, proper jars and lids and a wide-mouth funnel and make sure you have a good recipe to follow. You need a strong back and hands to lift the heavy canning pot full of water and jars and you want to be extra-cautious when handling boiling-hot jars, but there is nothing more satisfying than hearing those lids seal ("POP!") when they cool and seeing your produce lined up on the pantry shelf. 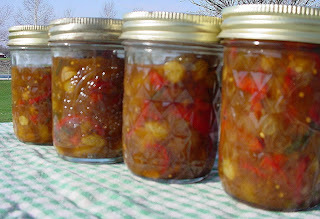 There are lots of great canning books and Internet resources to help you get started. In an enameled pot, mix sugar and vinegar. Heat to boiling, stirring occasionally to melt sugar. Add remaining ingredients and bring to boil. Simmer, uncovered, until a liquid is syrupy, at least 45 minutes. Don't cook too long or the all components of the chutney will turn a uniform brown. You can then cool and refrigerate your chutney or process it in a boiling water bath for 15 minutes. Makes 4 half-pint jars (two cups). This chutney is medium-spicy. If you want to kick up the heat you could add fresh chiles or cracked black pepper. Mango chutney is a divine accompaniment to any curry or spicy food, great slathered on a cracker with cream cheese or try a peanut butter and chutney sandwich (PBC). ***There is still time to join me in this month's joust. Participants must blog and enter their entry in the Foodie Joust by May 1st. See here for the Jousting rules. I am pleased as punch to be hosting this third round of the Adopt a Gluten-Free Blogger Event started by Sea at the great Book of Yum website. This event encourages us all to find a gluten-free blogger, or someone with a number of gluten-free recipes on their blog, and "adopt" them by making a dish and reporting back so we can all check out a final roundup of recipes and blog reviews. You can check the Book of Yum post here to see how this event got started. And here's a link to the Round Two Roundup and example posts. Round Three of Adopt a Gluten-Free Blogger will run from April 28 through May 11, 2008. During that time participants are asked to post their blog entries about their adoptees and include a photo if possible. You can also insert a photo badge from the Book of Yum like the one below to use in your post. There are also a couple of other photo badges at the Book of Yum link above. Then send me an email at info@oldsaratogabooks.com with your blog post link, a photo and any other information so I can get the rounding up underway. After May 11th, I will post a roundup of the entries and photos. I think it's a great way to find out about some new recipes and cooking techniques and I've already added the onion bhajis from Jeena's Kitchen and Coca-Cola Cake from Gluten a Go Go to my cooking repertoire. Plus, Gluten-Free Bloggers deserve lots of link love. I know my family and I have really benefited from the creative ideas, recipes and support from the gluten-free blogosphere when Dan got his celiac diagnosis two years ago and we had to overhaul our diet and cooking style. If you are interested in participating, please leave a comment below to claim your gluten-free blogger with your name and your adopted blog/website). The rules for this event state that you pick someone different from any previous picks you might have had and that you not pick a blogger that someone has picked already during this round. I will keep a running list of the participants to help us with our plans. The only other proviso is that you link to your adopted blogger’s recipe rather than posting it in your blog, for courtesy's sake. Please follow your chosen blogger’s recipe as printed, making only minor changes for reasons of allergy or veg/non-veg diet. 1) Cheryl of Gluten-Free Goodness is going to adopt Gluten-Free Bay. 2) Me (Rachel) of Wheat-Free, Meat-Free is going to adopt Fresh Ginger. 3) Sheltie Girl at Gluten A Go Go is adopting Naomi at Straight Into Bed Cakefree and Dried. 4) Carrie at Ginger Lemon Girl is adopting at The Good Eatah. 5) Teri at Faking It Gluten-Free Style is adopting Carrie at Ginger Lemon Girl. 6) Thomas at the GFCF Experience is adopting Natalie, the Gluten-Free Mommy. 7) In My Box is adopting Karina, the Gluten-Free Goddess. 8)The Gluten-Free Gastronaut is adopting Bea at La Tartine Gourmande. 9) Sea at the Book of Yum is adopting Kate at Gluten-Free Gobsmacked. Gluten a Go Go is this month's host for the "Go Ahead Honey, It's Gluten-Free" cooking challenge. April's theme called for portable, finger foods. We are hosting a book signing on May 3 with author Sheridan Hay at our bookstore and I plan on serving gluten-free cocktail snacks, so this was a timely cooking challenge. I mulled over a few ideas, like stuffing steamed baby potatoes with roasted red pepper-infused potato salad or some variation of my grandma's awesome stuffed celery, but then I remembered a dog-eared page in a new arrival to my cookbook shelf "Meet Me at the Loveless": A Southern Cafe's Cookbook, by Donna McCabe and Mamie Strowd (Franklin, TN: Cool Springs Press, 1998) with an appealing Cheese Balls appetizer. This Nashville cafe and temple to down home Southern cuisine is not known for its heart-healthy menu so much as its decadent deliciousness, so I wanted tone down the cholesterol and of course, make this recipe gluten-free. The first incarnation of this recipe was tasty but not round. 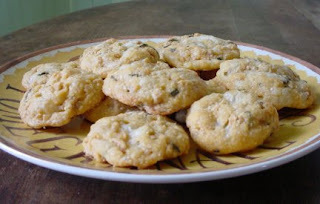 I used tapioca flour to replace the wheat flour in the original recipe and these babies flattened down to cookie height and had a texture like cheesy gummy bears. Not that this first batch had a long life span; they were wolfed down within a day by the family horde. Clearly, the tapioca flour had to be cut down and improved upon. My second batch was a marked improvement and the recipe that I am pleased to share below. I cut the tapioca flour in half and added brown rice flour in its stead. Perfect! It added a crisper texture and certainly the Cheese Balls, while still not round, were a better texture. The trick is to keep them small (3/4 inch diameter) so they don't spread out too much during baking and resemble a cookie more than a canape. Preheat oven to 375 degrees. Blend butter and cheese together. Stir in tapioca and brown rice flours. Add remaining ingredients and mix well. Shape into small balls (3/4 inch diameter) and arrange on non-stick baking sheet. Bake in oven 12-15 minutes or until brown on bottoms. Cool on wire racks and hide from ravaging hordes. Bhajimania continues at our house. The onion bhajis are favorites with the kids, while Dan and I like the string bean bhajis, especially as they use up the many bags of frozen beans we have in the freezer from last year's garden bumper crop. The beans, if thawed and wrung out well, get really crispy in the bhaji batter. We've been eating them with basmati rice and mango chutney on the side for a divine trio, but last time I whipped up a cucumber raita for a toothsome quartet and now this will become our bhaji standard. For inspiration, I turned to one of my favorite and reliable cookbooks, Madhur Jaffrey's "An Invitation to Indian Cooking". We also used leftover raita to make a creamy vinaigrette later in the week and then threw it on top of some lentil chili. It keeps well and is a nice condiment to have around. Mix all ingredients together and refrigerate for a few hours before serving to let flavors mingle. Gluten-Free Steve is celebrating his second year of gluten-free living by declaring this Sunday, April 13th, "Gluten-Freedom Day". To participate in this wonderful new holiday, people are asked to do something special for someone who is gluten-free. Now, I just baked two loaves of sandwich bread for Dan-O, but he's been jonesing for another Pavlova ever since I whipped one up a few months ago, so maybe I'll surprise him then with this airy confection. 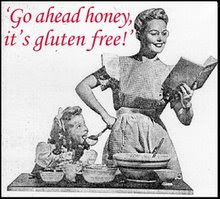 What are you going to do to celebrate Gluten-Freedom Day? Alas, I cannot grow leeks in my home garden as last year the fiendish resident moles found my tender leeklings and chew their hearts out. I should have anticipated this, as I had the same situation happen with tulip bulbs some years ago and both plants are members of the Liliaceae (Lily) Family. I had planted many dollars worth of classy Spring bulbs in pleasing oval pattern in our front lawn, which I had forgotten was rather boggy in the Spring. The result was a bunch of waterlogged bulbs that rotted in the ground, except for an especially hardy cluster of snowdrops which arrive each April in the center of our lawn and cluster of tulips which I unearthed and relocated to a higher, drier patch of flower bed. The next year the tulips rose up out of the ground and had just started to open up their brilliant red petals when they mysteriously shrunk downward about four inches. I inspected this anti-gravity growing and was dismayed to find that the tulip bulbs were entirely munched away, leaving only green shafts in their wake. In a spate of horticultural amnesia I snapped up some wispy leek seedlings last year to plant in a deep, heavily composted trench that I had carefully prepared. The young leeks prospered but did not live long in this bed, as the moles sniffed them out and rampaged about a month before harvest time. 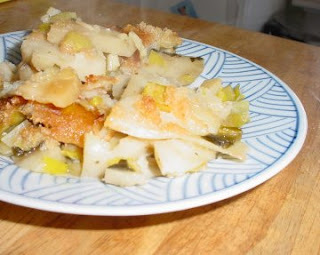 Since our family still has lots of leek love, I am forced to buy them from others and recently we dined on a delicious and gluten-free Leek and Potato Gratin. I am also working on a recipe for mole en casserole. 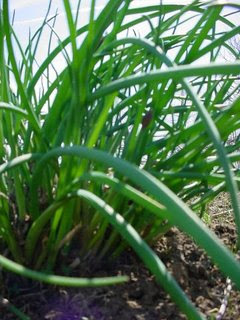 Carefully wash leeks, as they grow in hilled, sandy soil (in mole-free zones) and there is usually lots of grit stuck between the leaves. Steam leeks in boiling salted water for 5 minutes, until soft. Toss with salt and pepper to taste and dress with 1-2 Tbsp. olive oil. Toss sliced potatoes in another bowl with salt and pepper to taste, rosemary, thyme, garlic and another couple of Tbsp. of olive oil. Mix bread crumbs and grated cheese in a third small bowl. Butter or lightly oil a 2-quart baking dish. Layer in half of potato mixture, then add your leeks, then top with remaining potato mixture. Pour vegetable stock over all and then crown with cheese-crumb mixture. Cover with foil and bake 1 hour. Uncover and bake 1/2 more to brown the crumbs. If you are fortunate enough to live in an area where another Tulip and Leek Cousin grows, the Wild Ramp, do gather some up and report back to me on their lusciousness. I am quite smitten already with the reportage over at Ontario's Edible Tulip Blog on rummaging for ramps. We get so many people in our bookstore these days asking for gluten-free cookbooks that I am constantly on the lookout for them. We don't find a lot of used copies out there and when they do show up, they are snapped up almost immediately, so I am convinced that there is a market for more gluten-free recipe titles (HINT to all food writers out there). I will give props to this New York State company for having a wide variety of gluten-free and dairy-free mixes and foods and for keeping the prices reasonable. This mix made a bodacious amount of cookies (more than the 50 they estimate on the package) and the price on their website is eminently reasonable ($5.95). The cookies were good, not Really Great, though. I made several batches--some more well-done than others with my temperamental oven that requires vicious kicking to make it hiccup above 100 degress--and all were curiously dry while spongy at the same time. 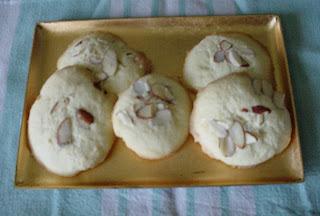 The lemon flavor was good, but they were somewhat naked looking without any adornment, so I topped them with sliced almonds. 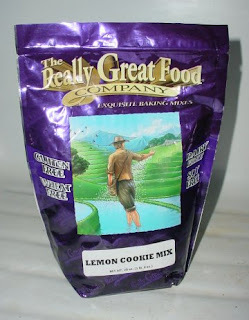 All in all, a B+ grade for this lemon cookie mix. There are some other interesting baking mixes on the Really Great Food website I may check out another time, like Spinach and Cheese Biscuits and a Rye-Style bread mix, so I encourage others to give it a look if they do a lot of baking at home. The Book of Yum is hosting an Adopt a Gluten-Free Blogger Event and I decided to adopt Jeena's Kitchen over in England. Jeena is a professional chef with a blog full of clear and detailed recipes for healthy cooking, many of which are also gluten-free, as noted in her index. She has lots of photographs to guide you through each step of a recipe, which is so helpful when you are first attempting a dish or cooking technique. Many of the recipes are vegetarian as well, and many are twists on traditional Indian recipes. 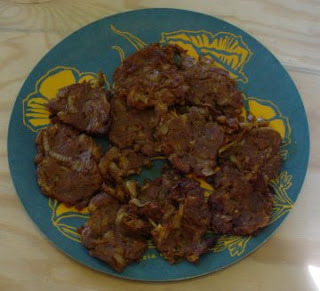 I had long bookmarked Jeena's recipe for Onion Bhajis (pronounced "bah-zhees"), which are a popular British-Indian starter in many restaurants and a close cousin of the pakora or pakoda. Typically they are deep-fried, but Jeena's recipe calls for baking. I made her recipe and everyone in the family really liked them. I have paired them with basmati rice for dinner twice now and that makes an easy meal for everyone in the family to enjoy, even my vegan teenager. Jeena's recipe directs you to drizzle oil on the bhajis midway through the cooking time, but I found that flipping them over instead worked well in my often balky oven. After a little bit of bhaji research, I found that they are usually accompanied by a cucumber raita or a mango chutney, so I will be whipping up some condiments for upcoming bhajimania. You can also serve bhajis on a bed of shredded lettuce with a squeeze of lemon or lime juice. I tried making bhajis a third time with chickpea flour instead of buckwheat flour and they were even more delicious. The beaniness of the chickpea flour, which I don't fancy in my sweet treats, is perfect in this savory recipe. We're going to keep experimenting, as other bhaji recipes I've seen utilize other vegetables, such as string beans, cauliflower, potatoes, carrots, sweet potatoes, peppers, spinach and even brussels sprouts. The versatility of this recipe is exciting for me, and I can't wait to try other add-ins, like snipped chives, cilantro, mint and peas. When the garden produce starts flying in July and August, I look forward to playing around with other bhaji delights. Vive Le Bhaji! 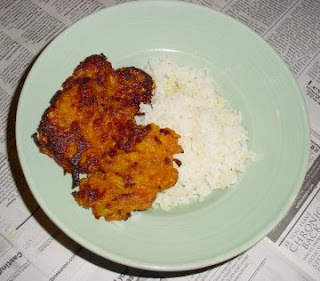 And thank you, Jeena, for turning me on to a new family favorite recipe! Sheltie Girl over at Gluten A Go Go is hosting a cooking challenge this month for the ongoing "Go Ahead Honey, It's Gluten Free (GAHIGF)" series. 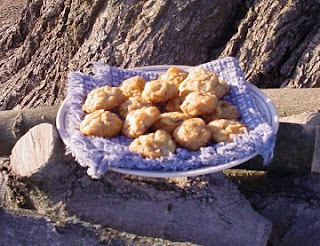 The April theme is for gluten-free finger foods you can pick up in your hands and eat without cutlery and plates. Between April 11-25th participants are asked to whip up a recipe and blog about it, and then link back to Gluten A Go Go. The pertinent details can be found here. 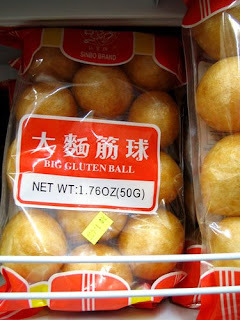 So I found this image on Flickr and am wondering how one could cook this up to make it gluten-free. Any suggestions?